As a newbie the hardest part is the beginning, keyword research before you start a website and register a domain. 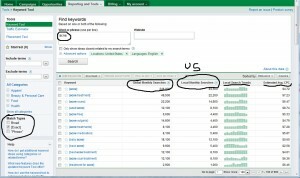 Keyword research becomes easier over time and in this post I’ll try to explain how I do things. There are many great courses out there on how to get started in internet marketing and for the purpose of making passive money online using SEO you want to make sure you get it right. I heavily recommend the keyword academy since they have more in dept information (they have a first month free trial too) and great tools (more on that later) for~$30 a month after the first month. Of course, do not waste too many hours/days hoping for the “perfect” niche/keyword because it probably will not happen. First off, if you are completely new to this I’ll give a brief explanation.. What are niches? A niche is something like the “Health” niche which has many sub categories such as nutrition and diseases. When looking for a website to start you do not want to make one on general health but instead drill it down. For example, Health –> Skincare –> Acne and from the subject of acne you start doing keyword research on the adwords google keyword tool. You might want to do a free adwords Google account ( you can use an existing gmail account) and login, that way you get up to 800 keywords when you search from something. You’ll see something similar to the picture on the right. You want to make sure you check the “exact” box and click on columns to enable global (searches around the world) local searches (searches in the selected country, US in this case), local search trends and Estimated avg CPC. Now, the last 2 can be quite important. Local search trends is useful to see if a keyword is seasonal (for example Christmas probably has higher columns around november/december, while acne is stable all year long as you can see). This is useful if you are building a keyword on something seasonal, don’t expect traffic until the season hits! This still can work very well, just don’t expect to make millions off your Christmas website during July! Estimated average CPC is another very important value if you are planning on using ad sense to monetize your website which is what is most easiest for a newbie. Basically, you can expect the average click to be around 50% of this value for your website. Why 50%? well the number shown there is a bit higher due to increased competition for ads on the google search box and also google takes a ~30% cut from each ad click on your website. so if you see a CPC value of $1 on the keyword tool, you can expect the AVERAGE click on your website to be around 50 cents. For adsense buyer keywords are less important but if you are trying to sell a product or service (affiliate income) you want to search target keywords such as cheap/buy “product name” or “product name” review/scam. This is because people are more prone to clicking on ads or buying the product your pimping on your website (hopefully with a solid review that you wrote) when they are searching for those words. Now, as you might expect theirs some great software out there to help you do keyword research and you really only need one of whatever software/service for keyword research that I might review or talk about on this website as a newbie with limited income. I used to recommend something called “Niche refinery” that was provided with the TKA subscription but it has been discontinued. Currently, I honestly almost always just type keywords in the google keyword research tool and see if they have potential in terms of search results and I click on the ones that interest me to quickly look at the PR/look of the website in the top 3-5 on Google using Seo Quake. 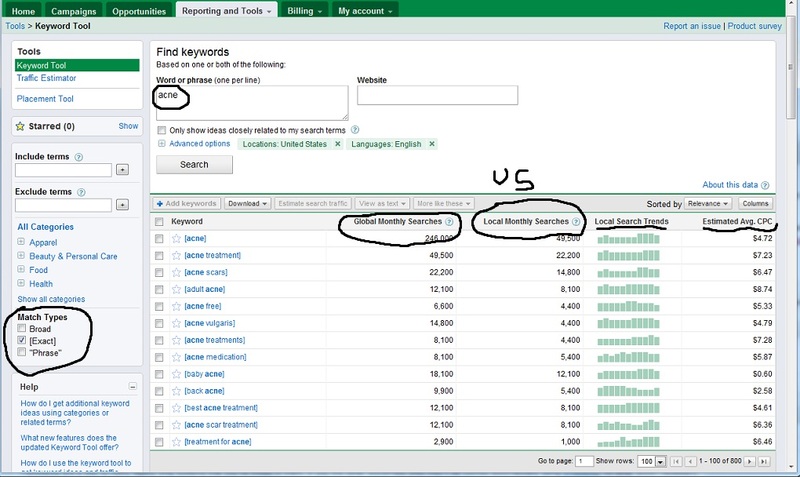 Earlier this year (UPDATE: in 2012 too, I made the video below) when I was looking for analyzing keywords I was using secockpit combined with semrush which I had made a post about. 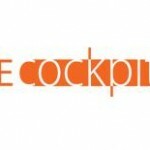 Secockpit is definitely an expensive service when you are starting out but if you go that route it definitely will help you save time in keyword research when you are starting out and that’s what most of your work hours are centered on. It’s also quite useful to quickly judge competition/domain availability and a few other metrics as I describe in the video below which goes in the process of how I do my seo keyword research and look at niches in detail. Most of the time I do not use any paid tools since I rarely start new websites. At this point I just think about new keywords for my existing sites and check if I feel I can beat the competition (low PR or if it’s a big brand ranking up top can my website do a better job?). However, Using Secockpit can definitely be very useful as a newbie to give you a better way to judge the competition until you have ranked a few websites and you get a better idea of battles you can win (and more importantly, how long does it take?). Here’s an image below about how I use it to quickly glance over large amounts of keywords and see potential winners in terms of competition I can beat. You can never truly know… but you get a better idea if you might be able to beat them and within 6 months or a year. I also use it a few months here and there when I want to start new websites and I need to process a lot of data. It makes it easier to track potential winners :). 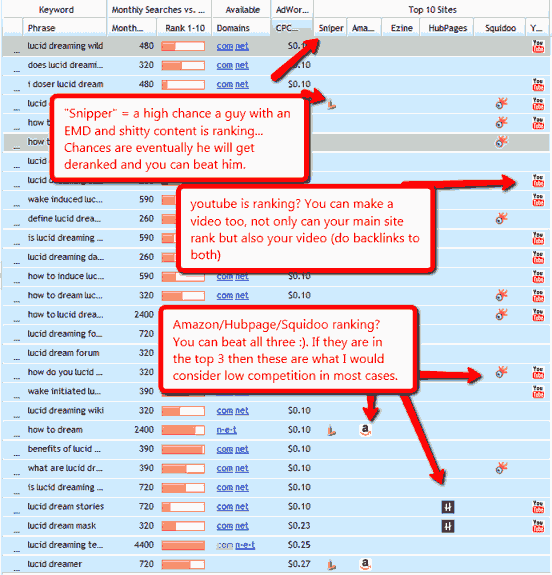 If you need more help finding niche ideas you might want to look at this post about how I use a paid service called SEmrush to help me find niche ideas that big websites are ranking for. I did a post and video on how I use semrush here. However, it will cost you $50 per month (though 1 month should be more than enough). Got your Keywords? Time to register and host a domain! If you have any questions about how I do keyword research or niche refinery ask away below! Surely when someone is looking for a keyword for a micro niche websites, he starts, verify (maybe at early stages) using Google tools especially keyword tool and traffic estimator. After registering and EMD and setting up the website and monetizing it with adsense, did someone make a comparaison of his real earnings or traffic with those shown by google traffic estimator for the CTR, the traffic and/or for the earnings (using CPC daily cost)? Using all the assumptions that #1 website gets around 60% of the traffic etc.. anyone can give a rough estimate (ranges in % maybe) on how much the numbers delivered by Google traffic estimator and keyword tool are really approximate the reality ? such test takes no more than 1 min for your keyword..
Alex, thanks for the post, it’s informative. Here is a basic question, when someone is starting out, do you suggest he should start with one website or multiple ones? multiple, like maybe 3-5. Unless you are focusing on one that you have a passion and will write big posts on, then maybe 1 passion website and 1-3 others that you can try SEO things on and then bring it back to your website that you like the most :). Thanks Alex. Now I got it. I like your site very much, good stuff, and the effort you put in to respond to people makes it so much better than the other ones out there. Now, one more question, I know a lot of people go crazy on keyword density, what is your recommendation. If i want my post to be rank high on a certain keyword, how many times should i mention it and where are best places to put it? Sorry for the late reply, keyword density is not all that important, I have posts ranking with 1% to 5%… Just make sure to ideally mention it in the title (if it reads well in it) and in the intro/body/maybe conclusion. It’s not that big of a deal. Niche Refinery has been ‘retired’ 🙁 What do you suggest in its place? Good question, honestly most of the time I just use type keywords in the google keyword research tool and see if they have potential in terms of search results and I click on the ones that interest me to quickly look at the PR and backlinks of the top 3-5 on Google using Seo Quake. Earlier this year when I was looking for analyzing keywords I was using secockpit (which is very similar to niche refinery and does a much better competition analysis but is double the price… per month) combined with semrush which I had made a post about. I never officially mentioned secockpit before because I felt it was too expensive compared to NR even if it’s better in terms of competition. Also, NR comes with postrunner and other useful TKA things. It’s hard to justify paying that much money for a newbie but I think one month of secockpit is worth it ONLY if you dedicate that month to verifying a lot of niche ideas, it’s pretty good at analyzing the competition properly unlike many other tools that only check how many other websites mention your keyword (VERY poor metric). EDIT: I”ll look more into what can be used and report shortly on the front page (I’ll try the new KTD tool too), I’ll also make a Secockpit video so people can determine if it’s worth it for them. Thanks a lot for this post! It’s great that you are helping so much! Quick question, you mentioned that one should be building A LOT of niche sites, and you are also building lots of them. I was wondering, are you outsourcing the content? I’m asking because I joined TKA, and they said that content is really really important, lots of it. Are you outsourcing it, or are you writting for yourself? By lots I do not mean 20+ by the way, I mean like at least 5-10. I started with 5. I started with doing it myself for a few mounts and eventually I had a full time job so while I was making money it was hard to have time to write so I hired someone else. So, eventually I moved to outsourcing. Hi Alex, thanks for the terrific advice, I went looking for reviews on Content boss and one of your links brought me to this page, I will go look at the other two posts you mentioned, my question would be, “how much would you expect to pay fora 500 word article if out sourced, I have tried a couple of places but the English isn’t so good which is always disappointing. I pay $1 per 100 words, but I choose people from Odesk after a long process. It takes time to find good ppl at those prices. I would just pay a higher amount unless you have a lot of articles that need to be written, then it can be worth doing the interview process and trying multiple ppl out. 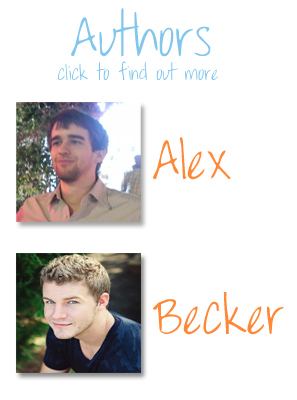 Hey Alex, I am new to IM and any kind of business online. For the past few days I’ve just been searching blogs and absorbing as much information as I can about the topic. My question is, what makes a promising keyword? I get how you search in the google adwords tool, and I’m starting to figure out SEOquake and understand exactly what it’s telling me, but what am I looking for? How do I know when I’ve found a keyword worth setting up sites for? Also, I know this is an old post and google adsense now has a column on competition for a given keyword. Based on your experience, is this a reliable measure? ps. I had the time to read more of your posts and this blog is super motivating. Thanks for all the quality material you have! and for FREE! It’s mind-boggling. The competition thing is useless for setting up websites, it’s for people doing advertisements (using adwords). As for keyword research, you never TRULY know if the keyword is worth setting a site for. That is why you have to try many and over time you have a slight better idea if a keyword has a good chance of being good but you never will “really” be certain. Hi Alex what’s a good way to test without spending a lot of money? you can’t really. When you don’t spend money you use time instead. The money route of testing keywords is to do PPC campaigns and see how keywords work and the search volume and how much converts to offers you might be promoting. For adsense, you can’t really know until you actually make a website and drive traffic to it.